Posted on January 17, 2019 by Sheldon & Russell Moore Homelife Glenayre Realty Chwk. 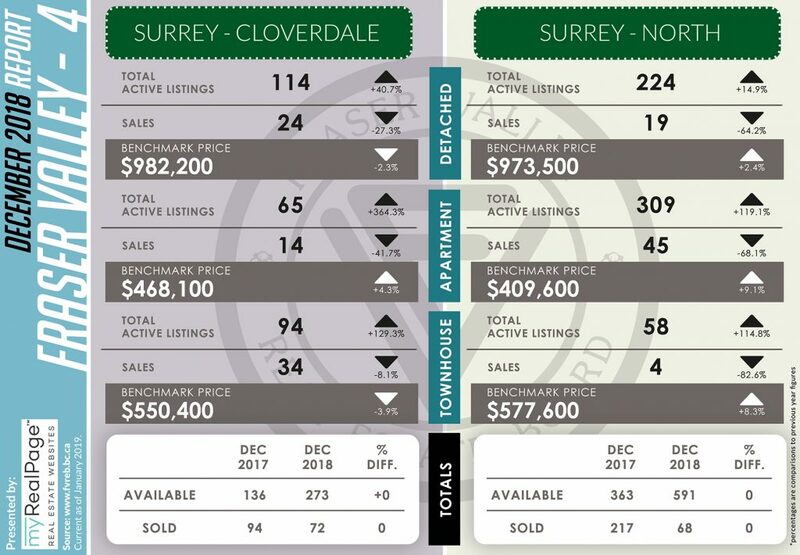 It’s that time of the month again, and here are the December 2018 market updates for areas covered by the Fraser Valley Real Estate Board (FVREB)! 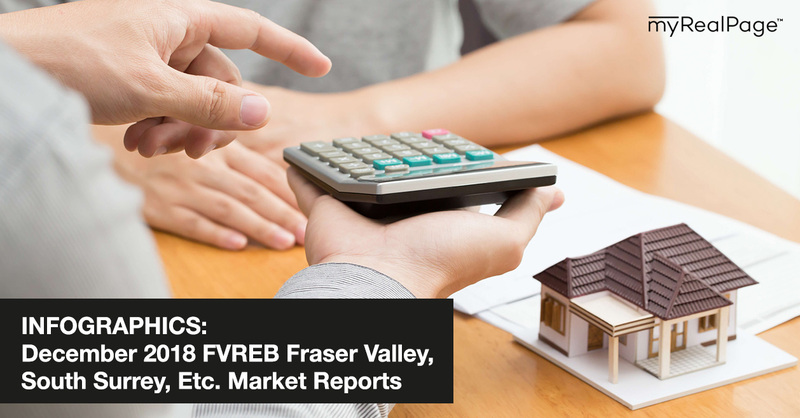 In their most recent press release, the FVREB has noted that the Fraser Valley housing market in general has seen a slowdown in 2018. According to the report, after three consecutive years of total annual sales surpassing 20,000 units, 2018 saw the Fraser Valley real estate market return to more typical levels for both sales and inventory. 2018 also saw the fourth highest total for new inventory in the board’s history, with 32,058 new listings received by the Board’s MLS system. For the month of December, inventory was at 5,454, with 978 new listings entering the market throughout the month. As for monthly sales, the board processed a total of 800 sales in December 2018, the lowest for the month since 2012. “In terms of demand, this is around what we’re used to seeing for our region. There is still a great deal of interest for Fraser Valley real estate, but with prices moving slowly and more inventory becoming available, many consumers are taking a deliberate approach now that they can afford to. 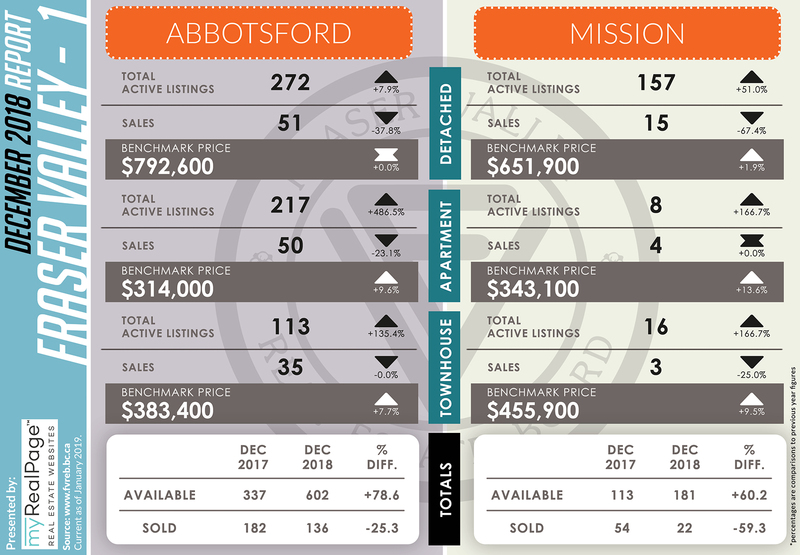 The following data is a comparison between December 2017 and December 2018 numbers, and is current as of January 2019. For last month’s report, check out our previous infographic!